This stone is part of the aluminum silicates family which is typical of the metamorphic rocks. 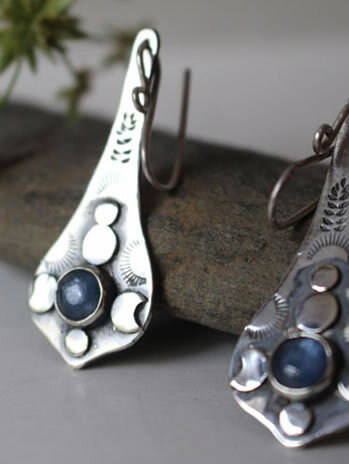 The kyanite stone is colorless and owes its blue color to the presence of chromifere. Its color varies from blue to purple, but can also be found as green, yellow, pink, white, brown and grey. Kyanite is also called disthene which comes from the Greek words « di » like two, and « destenos » or « strength ». This name is related to its electrical properties that you can get when rubbing this crystal. These properties vary according to the direction of the stone. This name was invented by René-Just Haüy in 1801. The word kyanite, which can also be found written like cyanite, was invented by Abraham Gottlob Verner in 1789. It comes from the Greek word « kuanos » or « blue ». The kyanite can also be called laminated beryl, cyanite, kyanite, sappare, blue talc, Munkrudite and zeolithe cyanite. There are two varieties for this stone. The cyanite chrome is a chromifere variety from New Zealand and Russia. The rhaeticite is a variety which color can go from grey to black. Mines: Austria, Braziil, Canada, USA, France, Italy, Kenya, Myanmar, Nepal, Switzerland, Zimbabwe. It seems that until the 20th century, it was confused with sapphire. This is the reason why it does not a history of its own. On the internet, the kyanite stone is mentioned as being used as a compass during antiquity. Due to its electrical qualities, it would be hung to a strand of hair of a person to guide travelers. Due to the little general information you can find online, I do not really think this last comment could be true, just like the one saying that the basis of the Archangel Michel’s sword was made of this stone. 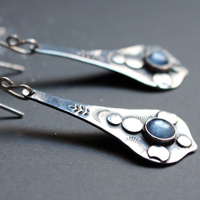 The kyanite would help strengthening hearing. This stone would be efficient against the extinction of the voice and larynx problems. The kyanite would help with therapy especially with the brain and nerves. The disthene would be efficient with urogenital problems linked to the surrenal and parathyroid glands.